It’s no doubt that the Spending Review has brought even more positive news for the house building industry - with new Schemes and Initiatives announced that will help even more people realise their dreams of home ownership but what about current new build prices? Shaun Peart, Managing Director for LSL Land & New Homes comments: “In some parts of the country prices are lower than they were at the height of the previous cycle, around the mid 2000’s, whilst some prime London Boroughs have seen close to a doubling of prices since the last downturn. And whilst wages are now growing in real terms, this follows a long period of economic instability with big question marks arising about the potential effect on mortgaged households of even a slight increase in the base rate. 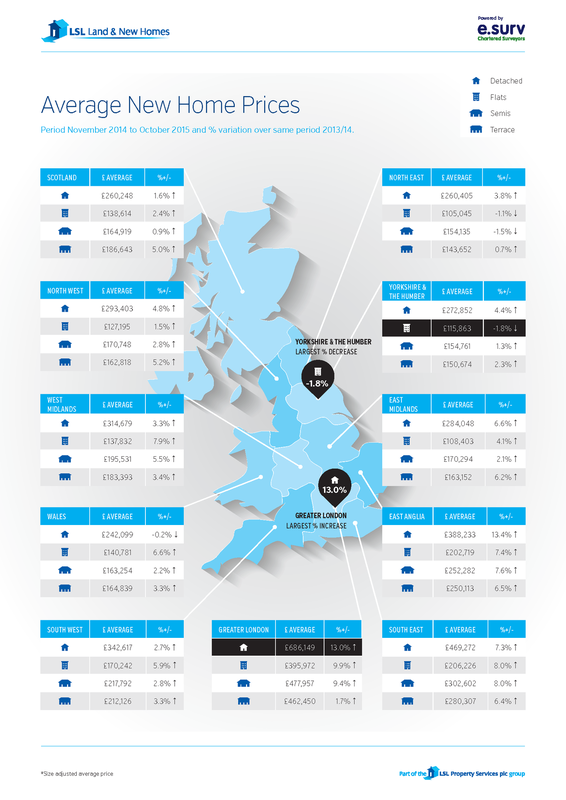 In terms of Year on Year house prices for new builds, the overall price index remains relatively static at 6.1%, which is slightly down on last Octobers figure of 6.4%, and last month’s figure of 6.5%. – as the graph opposite illustrates.